"CANTON COMB'N LOCK CO. CANTON. O". 3.370" high x 2.140" wide. Brass case. Brass shackle. Brass buttons. Brass dial. 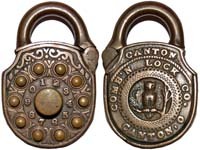 Mfg by: Canton Combination Lock Co.